Juvenile Arrest Rate | Propel L.A. Felonies and misdemeanors represent different levels of severity of crimes. A felony is the most serious type of crimes and is punishable by prison sentences of greater than one year. On the other hand, a misdemeanor is a lighter crime which is punishable by up to a year in jail. In every 1,000 children and youth under age 18 in Los Angeles County, 2.14 are arrested on felony charges and 2.53 on misdemeanor charges according to the California Department of Justice. For perspective, the odds of being a minor being arrested on felony charges in Los Angeles County is higher than the odds of being an American killed in a car, van, or truck incidents. 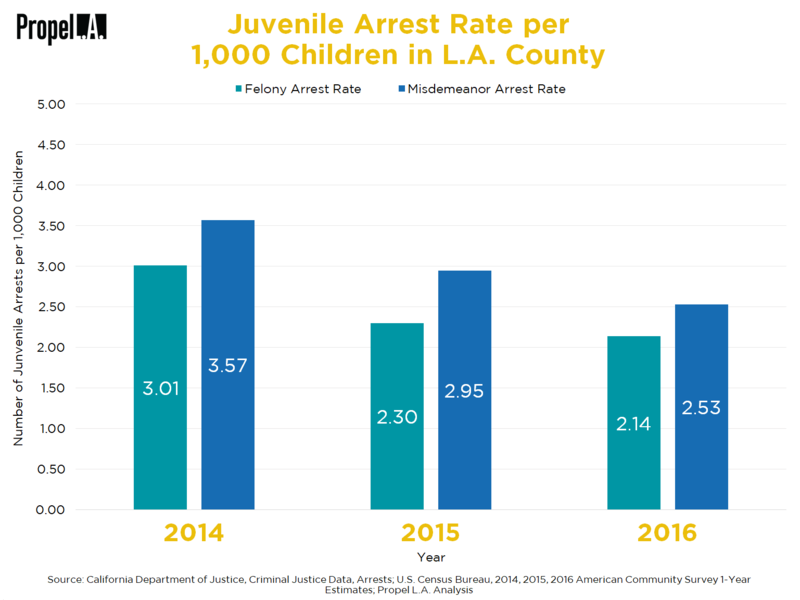 Fortunately, the overall number of children and youth entering the juvenile justice system in Los Angeles County is decreasing on average with felony rates trailing behind misdemeanor rates.